Yeast and mold growth may be produced in cheese, rendering it unfit for human consumption. Therefore, during ripening, cheeses are protected against development of mold by coating of their surfaces a protective layer. Natalac™, containing min. 50% natamycin produced by fermentation using a strain of “Streptomyces natalensis”, has considerably facilitated protection of cheeses against yeast and mould growth during ripening. "Natalac™" may either be added to brine, used as an aqueous suspension for dipping of cheeses or added to polyvinyl acetate used to coat the cheese. 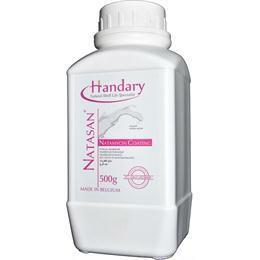 *Natamycin, at a concentration considerably lower than other known fungicides, destroys both mold hyphae and spores. The inhibitory concentration of sorbate is as high as 300 mg/dm² of cheese surface, while the permissible concentration of natamycin is only 2 mg/dm². Sorbate diffuses into cheese and affects its organoleptic properties, whereas the migration of natamycin is negligent, and when used in polyvinyl acetate, it remains on a surface of the cheese. Natalac™ Natamycin is a naturally occurring anti-fungal agent produced during fermentation by the bacterium “Streptomyces natalensis” and blended with lactose. It is used to effectively eliminate the risk of yeast and mould in dairy products. ● Natalac™ may either be added to brine, used as an aqueous suspension for dipping of cheeses or added to polyvinyl acetate used to coat the cheese. ● Direct addition in yoghurt. *Please contact us for specific information. Natalac™ is available in 500 gr/bottle or 50 g/pouch with integral, tamper-proof seals. Packaging is available in other quantities. Natamycin under Natalac™ brand is a food preservative that is approved and used in more than 50 countries around the world. 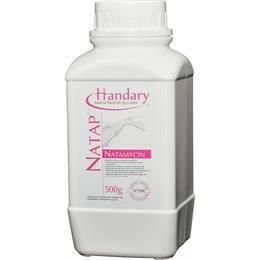 The WHO, EFSA and FDA have evaluated Natamycin thoroughly and all list it as safe for human consumption. * Natalac™ may either be added to brine, used as an aqueous suspension for dipping of cheeses or added to polyvinyl acetate used to coat the cheese. * Direct addition in yoghurt.